Naturally, all this attention stems from the Jeep's imposing looks. To start off, it's huge and is just short of a Q7 or a GL-Class. It's almost five metres long, two metres wide and stands taller than the average Indian (4821mmx1943mmx1730mm). The design is well-proportioned with strong and square wheel arches and a clean, almost Fortuner looking rear end. The design, however, has plenty of drama like the iconic seven slat grille and the slim and futuristic-looking headlamps. A big part of the Jeep's visual drama is the massive use of chrome. The grille is full chrome and so are the massive 20inch wheels. There are chrome details in the headlamps, fog lamps and front bumper. The excessive badging along the side is also chrome, the greenhouse surrounds are blingy and so are the door handles and roof rails. And of course you have a chrome detailed rear bumper, loading bay sill and badging. Some might say it is too much, but I think the bling suits the big American SUV perfectly. And let's not kid ourselves, we love chrome on our cars and have always associated it with being 'premium'. Everything looks and feels well put together with a clean, uncluttered looking centre console. The insides are a pleasant surprise for an American utility vehicle. 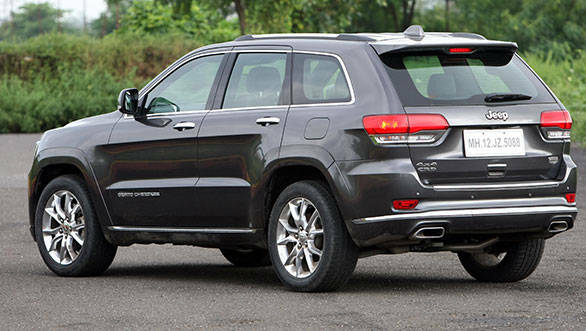 With the 2014 model, the Grand Cherokee went upmarket and it shows. The dash and doors are constructed in a wonderful mix of leather, soft feel material and some lovely wood paneling with actual graining. 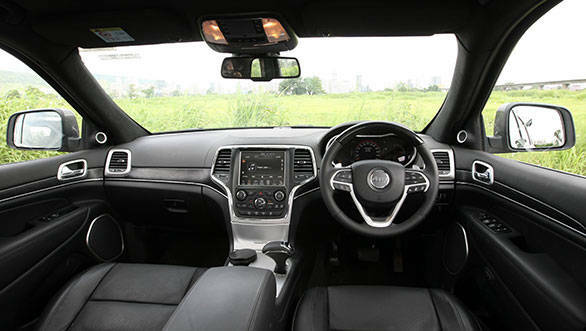 Everything looks and feels well put together with a clean, uncluttered looking centre console. 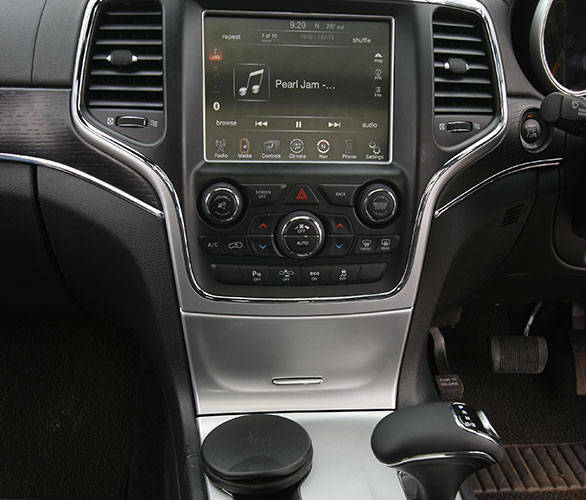 The large 8.4-inch touchscreen display features rich graphics and control over most of the features like the dual zone climate control, the heated and ventilated seats, the audio and equalizer controls, and access to the Jeep's myriad of safety and setup options. The display, however, could do with a little better feedback. Nevertheless, the sound system is brilliant and offers USB, AUX and SD card input. 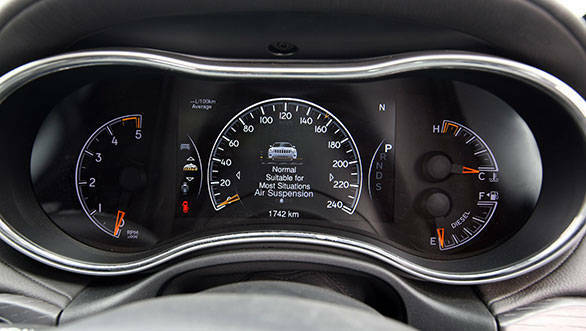 The centre console has analogue dials on either side with the rev counter on the left and fuel, engine temperature gauges as well as the gear selector readout on the right. The centre, however, is fully digital and offers multiple viewing options. You can switch from a kmph to an mph dial and also have access to multiple modes for trip data, off-road modes, and more. You can even get data like voltage level, gearbox oil temperature, engine oil life, tire pressure and more! The off road modes give you information on air suspension settings, steering angle and which axle the power is going to, wheel articulation and more. Full paragraphs can be written on just the information from this little digital display. The electrically adjustable leather and wood finished steering wheel is peppered with buttons. There are 22 of them to navigate the digital display and control the audio, cruise control, adaptive cruise control and Bluetooth telephony. It takes a while to get used to them, especially the tiny audio buttons that are hidden behind the wheel. All the controls for the wipers and headlamps are mounted on one stalk like you'd find in a Mercedes. But unlike a Benz there's no steering-mounted gear selector stalk on the right. Instead you get a lovely Audi A8-esque T-shaped selector on the transmission tunnel that feels great in the hand. The selector, however, easily slips into the wrong gear  Reverse and Neutral and particularly annoying and I found myself slotting the wrong one more than once. 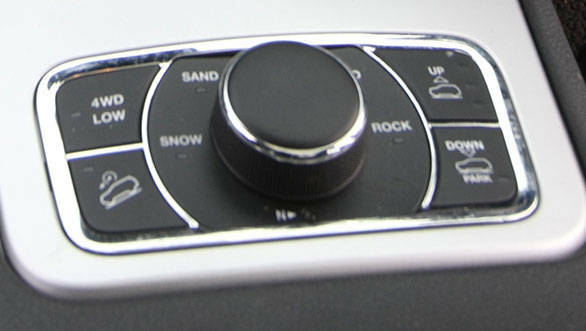 There's also an array of off-road modes with a Range Rover style rotary selector for terrain mode and controls to raise and drop the air suspension. 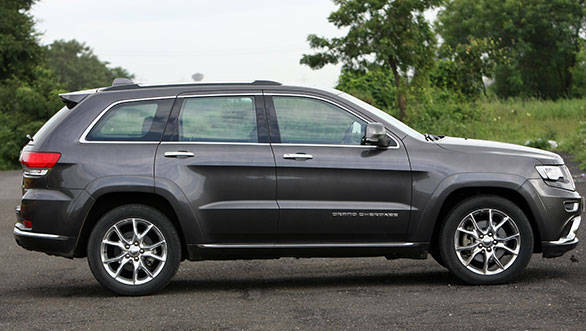 In the highest setting, the Grand Cherokee stands almost a foot off the ground. You also have hill descent control and a proper low ratio mode for when the going gets seriously ridiculous. 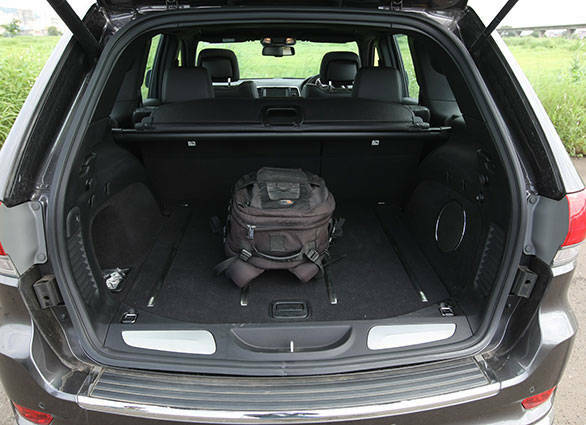 All in all, you get a spacious cabin for five with a large boot (that opens and closes at the touch of a button). There's a massive double panorama sunroof and rear passengers get aircon controls, seat warmers and two further USB ports. Material quality is great, but that being said the plastics used in some areas like the metal finish on the centre console don't match the premium feel from the top German SUVs. 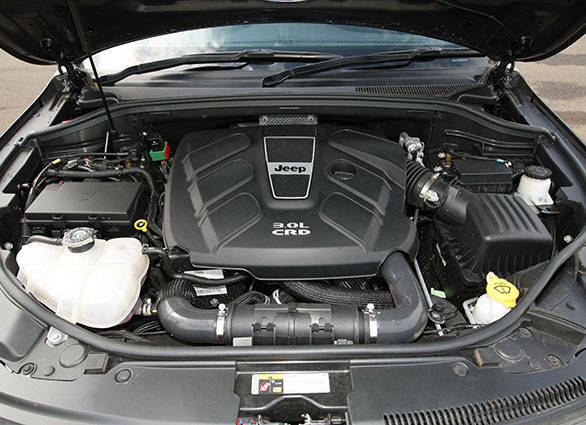 The Jeep runs a 3.0-litre V6 diesel that has been designed by VM Motori of Italy which is partly owned by Fiat. The engine has similar specs to the competition with 240PS and 580Nm of torque on offer. It has a smooth refined quality but with a nice burble (for a diesel) when you rev it. It's all about the strong bottom and mid-range shove here, and there's no point going beyond 4000rpm. The 8-speed ZF transmission is nothing short of excellent and always has the right gear handy while being smooth and imperceptible. You can shift using the steering-mounted paddle shifters, but the box is so good that there's really no point in a hefty diesel vehicle like this. This Jeep weighs 2.4 tonnes but the combination of a diesel engine and a smart gearbox meant we got a decent 8.8kmpl in city and 12.8kmpl on the highway. A 93-litre fuel tank translates to an impressive range of over 900km if driven carefully. Nevertheless, performance is brisk with an 8.3 second run to 100kmph, strong in-gear acceleration and a top speed over 200kmph. Braking performance is reassuringly strong and the hefty machine grinds to a stop in an short 42.6m. Brake feel is good and theres strong and progressive bite that adds further confidence to the experience. 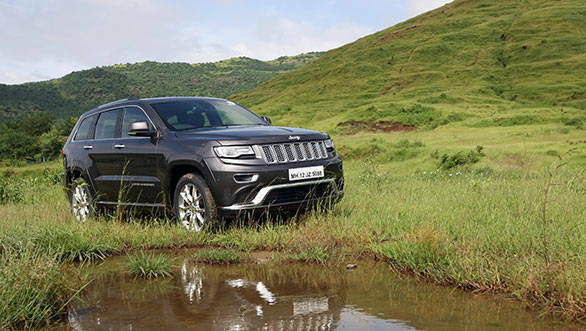 The Grand Cherokee feels like a very accomplished package both on and off road and that's probably because underneath the skin it's based on a modified 2012 Mercedes-Benz ML-Class platform. The Summit we are driving is the top variant available and rides on air suspension. High speed ride on smooth roads is fantastic with an unruffled and isolated feel from the road that you only associate with very high-end vehicles. There's strong, confident performance from the brakes as well. 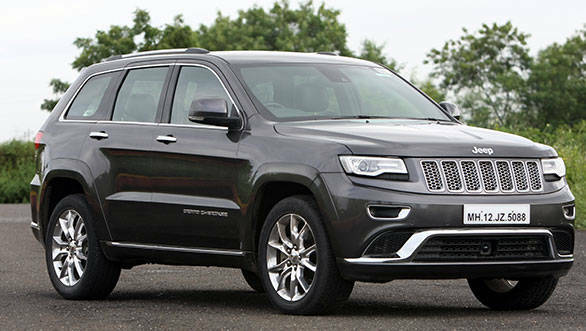 The Grand Cherokee is, however, an off-road vehicle at heart and there is some pitch and roll when you start to push it. It also doesn't seem to handle higher speeds on rutted roads as well as its German competition. The electrically assisted steering offers good feedback when you're off road, but tends to follow the breaks and undulations in the road surface at speed requiring you to make corrections. 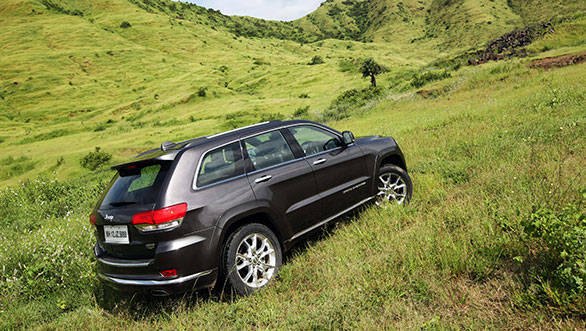 The Grand Cherokee, however, comes alive once you get off the beaten path. The air suspension can raise the car by up to 66mm, while the Selec-Terrain traction control system sets up the power delivery depending on whether you're driving in snow, mud or over rocks. We never had to but you can also engage the low ratio transfer case via a small button to get through the really tricky stuff. Most people won't use this Jeep the way it was intended to, but rest assured it can handle almost anything you throw at it with complete ease. 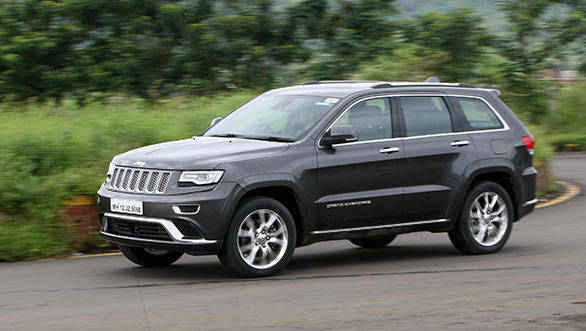 We expect Fiat to launch the Grand Cherokee between Rs 60 lakh and 65 lakh when it gets here by the year end. Now that's certainly not cheap, but what you get is a true luxury vehicle. The driving experience is almost serene, with excellent noise deadening, a superb drivetrain and very high comfort levels. It may be massive but visibility is very good and it's easy to drive both in town and on the highway. Sure there are areas in the cabin that aren't up there with the competition and it may not be quite as accomplished on road either, but the Grand Cherokee has one ace up its sleeve that its rivals can't match (perhaps with the exception of the Porsche Cayenne). The Jeep has soul. It's a vehicle you bond with and grow fond of rather quickly. It possesses a sense of character that its excellent but inert rivals just don't have. Of course that's not reason enough to drop 60 big ones, but the Jeep also has a massive feature list and those handsome, imposing looks our market so obviously craves. It's also one of the most capable luxury off-roaders on sale today. The Grand Cherokee thus has a lot going for it. What remains to be seen is how Fiat ramps up its customer and service experience to serve customers buying this premium and expensive vehicle over the more obvious and compelling choices available today.